KANSAS CITY, Kan. — The bishops of Kansas want Catholics to know that citizens of heaven have earthly responsibilities, too — including faithful citizenship. Archbishop Joseph F. Naumann of the Archdiocese of Kansas City in Kansas, Bishop John B. Brungardt of the Diocese of Dodge City, Bishop Carl A. Kemme of the Diocese of Wichita, and Bishop Edward J. Weisenburger of the Diocese of Salina spoke about the moral aspects of voting in a recently released video produced by the Kansas Catholic Conference. The video can be viewed in Spanish and English. “Just as living a Christian life involves much more than going to church on Sunday, so responsible citizenship requires more than simply voting on Election Day,” said Archbishop Naumann. Voting, which is a crucially important duty of citizens, should always be taken very seriously. But what should be the basis of our political choices? As examples, the bishops said all Catholics should work to ensure all — and especially the poor — have health care. The Catholic voice also needs to be heard in the debate over immigration policy. “Catholics should recognize the need for good stewardship of the environment, so that future generations can enjoy the gifts of God’s creation,” said Bishop Kemme. The bishops also said that there must be a “special emphasis” on issues where Catholics must speak with a unified voice — issues that directly contradict church teaching, natural law and the good of society. Catholics must also be aware of the proliferating attacks on religious freedom. “More and more, government agencies are attempting to punish individuals and institutions that adhere to the truth that marriage can only be between a man and a woman, and that every child deserves a mother and a father,” said Archbishop Naumann. Not all issues are settled in the legislative and executive branches. “Catholics should also consider the critical role that judges increasingly play in deciding issues like abortion, marriage and religious freedom,” said Bishop Kemme. Citizens are left with no recourse by judges and unelected officials who take debates about these issues out of the democratic process and decide them for themselves. “It is thus absolutely essential that we have judges who respect the right to life and marriage as a covenant between one man and one woman, and who will protect religious freedom and rights of conscience,” said Bishop Weisenburger. 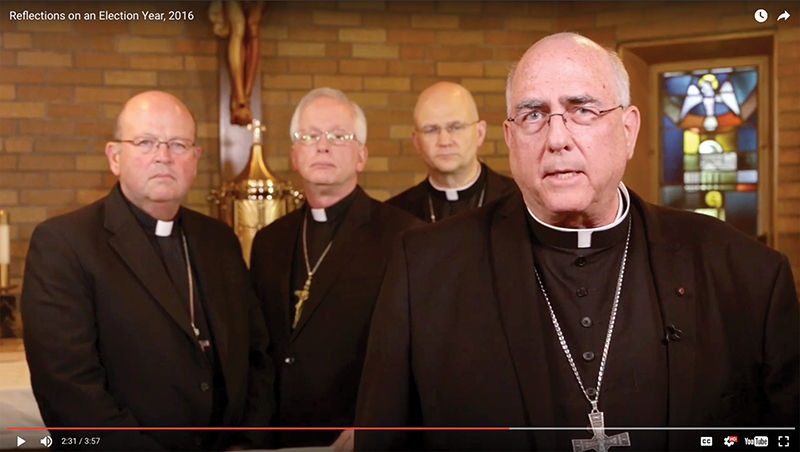 To view the Kansas bishops’ faithful citizenship video in English or Spanish, click here.